This assignment focuses on for loops, parameters, and graphics. You will also get practice using the DrawingPanel (which you will need to download), Graphics and Color classes. For the first part of the assignment, turn in a file Doodle.java that draws a figure using the DrawingPanel class. You may draw any figure you like that is at least 100 x 100 pixels, contains at least three shapes, uses at least two distinct colors, is your own work, and is not highly similar to your figure for Part B. Your program also should not have any infinite loops. Your score for Part A will be based solely on external correctness as just defined; it will not be graded on internal correctness. You may want to start with Part B and design a Part A based on how much time you have left. Use animation! Use color! Use repetition with for loops! In the second part of the assignment we will be exploring something that is known as the Café Wall illusion. You are to produce the image below. It has a size of 650 pixels by 400 pixels and has a gray background. This image has several levels of structure. Black and white squares are used to form rows and pairs of rows are combined to form grids. The output has two free-standing rows plus four grids. You should first write a method to produce a single row. Each row is composed of a certain number of black/white pairs of boxes where each black box has a blue X in it. Notice that we specify each row in terms of how many pairs of black/white boxes it has. Your method doesn’t have to be able to produce a row that has a different number of black versus white boxes. The boxes are specified using a single size parameter because each should be a square. You should develop a single method that can produce any of these rows by varying the position, the number of black/white pairs, and the box size. Each grid is a square, which is why a single value (number of pairs) indicates the number of rows and columns. For example, as the table above indicates, the lower-left grid is composed of 4 pairs. That means each row has four pairs of black/white boxes (8 boxes in all) and the grid itself is composed of 4 pairs of rows (8 rows total). A single box size is again used because each box should be a square. The offset indicates how far the second row should be shifted to the right in each pair. The figure in thelower-left has no offset. 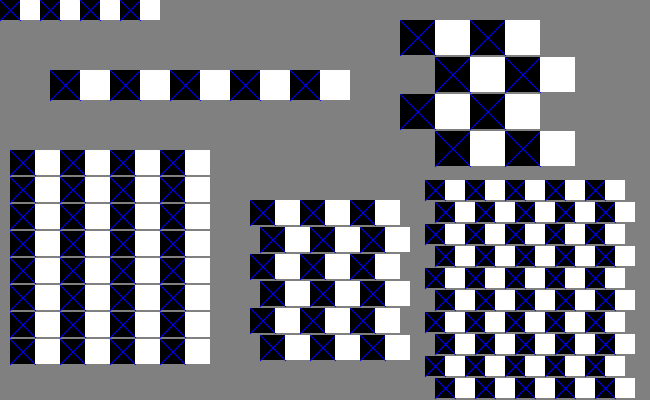 The grid in the upper-right is offset by the size of one of the boxes, which is why it has a checkerboard appearance. The other two grids have an offset that is in between, which is why they produce the optical illusion (the rows appear not to be straight even though they are). Each pair of lines in the grid should be separated by a certain distance, revealing the gray background underneath. This is referred to as the “mortar” that would appear between layers of brick if you were to build a wall with this pattern. The mortar is essential to the illusion. Your program should use 2 pixels of separation for the mortar, but you should introduce a class constant that would make it easy to change this value. You are required to have the two methods described above (one for a single row, one for a grid). I expect good style (indentation, commenting, good variable names, etc.). Include a comment for the class and for each method. 1. A good way to get started is to first write a program that prints just the row in the upper-left corner. 2. Remember a for-loop body can have multiple statements. In particular, it could draw two of something. 3. When writing your grid method, remember that you have a row method you can still use. 4. The gap between rows in a grid is not something you draw – it is the background showing through.